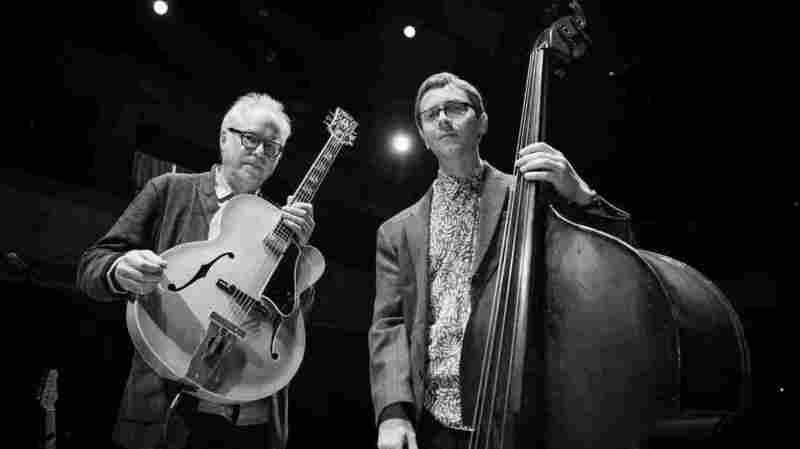 Bill Frisell And Thomas Morgan Finesse The Iconic Theme 'You Only Live Twice' Bill Frisell, an elite jazz guitarist, teams up with bassist Thomas Morgan to imagine a playful riff on this 007 theme. Frisell and Morgan have another album on the near horizon: Epistrophy, which ECM will release on April 12. Like their previous release, it was recorded at The Village Vanguard in New York City, and features an eclectic bundle of compositions — including a Bond theme. In the case of this NPR Music premiere, it's another involving take on "You Only Live Twice," which was composed by John Barry, and originally served as a vocal showcase for Nancy Sinatra. Epistrophy, which borrows its title from a Thelonious Monk composition on the album, suggests the latest in a series of intimate triumphs for Frisell, who will turn 68 in a few weeks. Last year he released a gorgeous solo guitar album, Music IS; received co-billing on Lebroba, an experimental outing with drummer Andrew Cyrille and trumpeter Wadada Leo Smith; and played a featured role on albums by Paul Simon, Mary Halvorson and Charles Lloyd. But there's a particular delight in hearing Frisell and Morgan finesse this iconic Bond theme. The low-key confidence of the duo's performance invites a playful riff on 007's signature martini instruction: unshaken, but stirring.